Who Will Kiss the Goat? Donate any amount during lunches to the rolling “goat” cart through Dec. 5 to decide which of five Timber Creek High School teachers will kiss a goat during Friday’s pep rally. 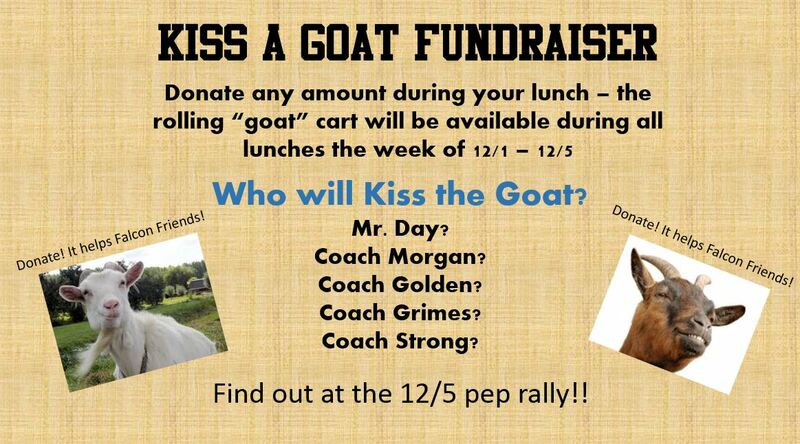 Students can select to put money towards making Mr. Day, Coach Morgan, Coach Golden, Coach Grimes, or Coach Strong kiss a goat at the Dec. 5 pep rally. Proceeds go to support Falcon Friends.